Rajya Sabha Question Hour session: Has there been a case against offenders? Monsoon session of Parliament: Last sitting before general elections? Chairman: Honourable Members, I am sorry that I could not be here the other day because of some bereavement in my family. I normally do not miss the Parliament, but it was beyond my control and, then, it was duty also to be there in my village. Now, I would like to make an appeal to all the Members once again that we have entered into a new year and we are left with just four working days. Then, after that there may be another Session — as we are all aware that before the elections the Government normally just go for Vote on Account — only for few days. That will also be for only a few days. So, it will be a continuous Session as per the present arrangement. Keeping that in mind, we have to understand that we have a heavy agenda before us. A number of Bills — the Bills which have even gone to the Select Committees and come back with some unanimous recommendations and the Bills on which there is a broad consensus in the Business Advisory Committee about the need to pass them after making our suggestions and criticisms, if any, — there are also a number of such Bills lying. All these Bills have been allocated time by the Business Advisory Committee. In addition to this, we have also identified certain important issues to be discussed in this Session of Parliament to which I have already given permission. These have been admitted. We could not take up the discussion on the cyclone in the Southern States. Then, we have on agenda, the issue of agrarian problem in the rural sector. Then, we have the problem of price rise for which notices have been given by some people. Then, we also have issues which have been agreed upon to be discussed here, plus Bills. …(Interruptions).. That is a Bill. When the Bill comes, then your Resolution also will come up automatically. Then, there is Rafale issue also. So, with all these important things, the country is looking to us. I am, particularly, concerned because of the loss of the image the House is suffering. Another thing is, not to make comparison or to be envious -- the other House is functioning; the Bills are getting approved, and we are not able to function here. So, please, I appeal to all of you. We have just now, today, released the calendar for the New Year canalizing all the great people who have presided over this House, the Leaders of the House and the Leaders of the Opposition at that time, then, the Leaders of the Opposition who became the Leaders of the House subsequently, the Leaders of the House who became the Leaders of the Opposition subsequently, and then, the Leaders of the Opposition who became Prime Ministers. So, there is a history. Then, there have been 12 Chairmen before me. We all have expressed the need to have a meaningful debate in this House. One of the Leaders of this House has become Prime Minister, another Leader of the House has become the President of India also, Shri Pranab babu. So, keeping all these traditions in mind, I earnestly appeal to all of you. Whatever issues you have, please come to me if they are already not admitted, I will consider them positively. Secondly, any issue cannot be dictated that you do this way, only then we will allow the House. (Interruptions).. Please, please. The image of Parliament is taking a beating. That is why people are laughing at us. I am not able to digest it as the Chairman of this House. After all, you are all senior Members. Please, tell what is the problem? Shri Anand Sharma: No problem, Sir. Mr Chairman: People are laughing at us; still, we are laughing. We are laughing at them, that you have elected us but see, what is happening! I don’t want this sort of situation in the House. 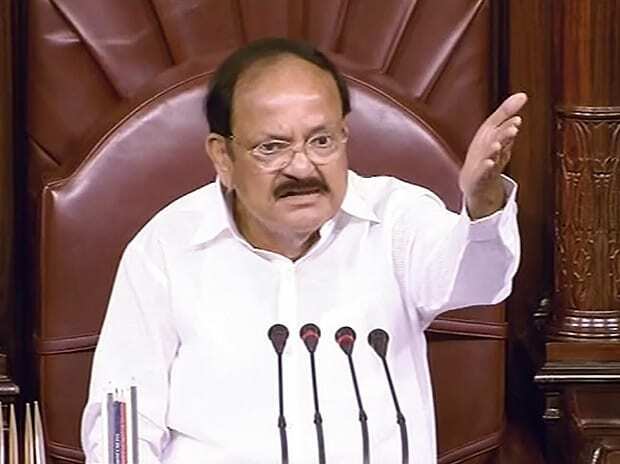 I earnestly request to all of you again, please cooperate; see to it that this House functions for the remaining days in a meaningful manner, and, then, pass some legislations after having some meaningful discussions. This is my appeal to all of you. Dr T Subbarami Reddy: Who is disturbing every day? It is only the AIADMK. Please request them to cooperate. See, again, they are coming. Mr Chairman: Each one accusing the other is not going to help. …(Interruptions).. Dr. T. Subbarami Reddy, please sit down. Mr Chairman: The calendar and diary are available in the Publication Centre. …(Interruptions)… Let the House discuss and decide that 'we need to go for action.' The Chair is ready for action. …(Interruptions)… But it cannot be selective. …(Interruptions)… Anybody disturbing the House, anybody coming to the Well of the House, action has to be taken. If I have the consent of the entire House, then we can think on those lines and move forward. …(Interruptions)… But it cannot be selective. 'If they come to Well, take action; if we come to Well, excuse us.' …(Interruptions…(Interruptions)… So, please understand. …(Interruptions)… Dr. Santanu Sen to speak on concern over certain provisions of the Consumer Protection Bill.